"Fairy tales helped me disappear into worlds where princes were loyal and honest and where princesses were strong and brave." Any of my book friends will tell you that Archer's Voice is my favorite book by Mia Sheridan. It doesn't mean I didn't like her other books, it's just that Archer's Voice is my favorite. Knowing that I enjoyed Mia's writing when the opportunity presented for me to get an early copy of More Than Words, I wasn't going to pass it over. Who would have thought that meeting in an abandoned train boxcar would have an effect on two people so great that neither will forget it? When Callen Hayes and Jessica Creswell meet for the first time, they are both teenagers. They soon realize they have something in common. Neither has a happy home. Jessica likes to pretend she's in a fantasy and she sees Callen as her broken Prince. For his part, Callen is happy to let Jessica read to him and take him away from his problems. Several months later and after they share a special moment, Callen disappears from her life and they don't see each other until they are both adults in Paris. Sadly, the reunion doesn't go as planned. Callen doesn't recognize her but after that night, he can't seem to forget the woman who said those words to him. As fate will have it, they will meet one more time but this time might be their last chance. Callen is a well-known composer who has lost his muse until he has Jessica back in his life. Yet, his fame as a womanizer and a borderline alcoholic doesn't ensure confidence from Jessica. She knows she won't be with a man who can't remain faithful to her. For his part, Callen can be his worst enemy but Jessica brings back the music to him. She inspires him and makes him want to be better. The question is can he let go of his past? 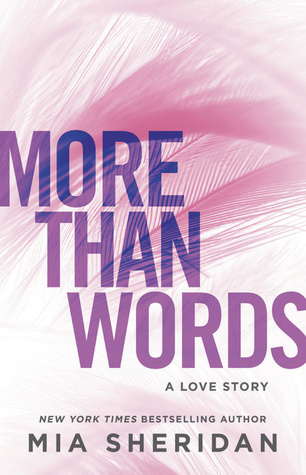 More Than Words gives a message of hope and love which is perfect for a romance fan. "I want to live fiercely and without regret."